Defense Ministry said Wednesday it is seeking to enact a special law for ensuring the military’s political neutrality amid the allegation the Defense Security Command considered imposing martial law during massive protests against former President Park Geun-hye last year. “Currently, the Ministry of National Defense is seeking to enact a special law to make sure the military stay neutral in political affairs,” said a senior defense official during the meeting with reporters. The special law is expected to include clauses that prevent superiors from ordering subordinates to participate in political activities. The subordinates, for their part, are required to refuse such orders, according to military officials. The measure came amid the government’s efforts to investigate the allegation that Defense Security Command had drawn up a plan to impose martial law in March last year, when South Korea was waiting for the Constitutional Court’s ruling on former President Park’s impeachment. On Wednesday Defense Minister Song Young-moo appointed an Air Force judge advocate as the chief investigator of the special probe. Col. Jeon Ik-soo and his team are authorized unfettered access to relevant materials and are exempt from reporting to the defense minister. “In accordance with law and principle, I will do my utmost to conduct a thorough investigation into the allegation (against the Defense Security Command),” Chun said during an appointment ceremony presided by Song at the Defense Ministry. The investigation team is expected to consist of about 30 prosecutors from the Air Force and Navy. Those from the Army and Defense Security Command will be excluded. The investigation team will conduct their inquiry until Aug. 10. President Moon Jae-in ordered a special probe into the Defense Security Command after documents surfaced that allegedly show that the Defense Security Command prepared a plan to impose martial law in March last year. Then-Defense Security Commander Cho Hyun-chon reportedly submitted the document to then-Defense Minister Han Min-goo. 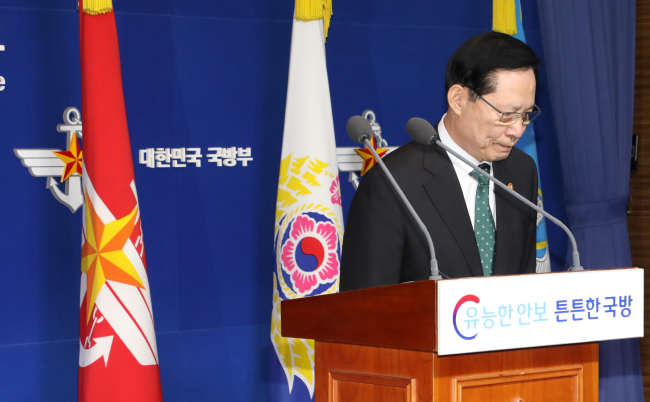 In an interview with Chosun Ilbo Wednesday, Han’s aides said the document was never reported to former President Park and her presidential staff.